All slides are machined to order due to the wide variety of options offered. Your funds will be captured when the order is placed to reserve your slide. Slide orders typically ship in 4 weeks depending on production scheduling and machine time availability. Stainless slides ship faster than Black Melonite as there is no outside coating process performed. The Charlie is available machined to accept the Aimpoint ACRO, Trijicon RMR or Leupold Delta Point Pro. Direct Mounting of the Aimpoint ACRO to the Slide. Attachment Rail is milled directly to the slide. Dovetail for rear iron sight behind the ACRO. NO intermediary plate system. 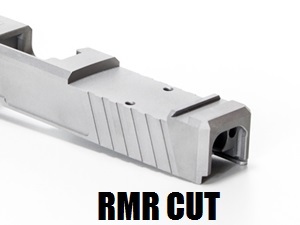 RMR Cut Models now all include recoil bosses for the RMR. It also includes rear sight dovetail and cover plate if you do not wish to use the RMR. Sealing plate that goes between the RMR and the slide is included. 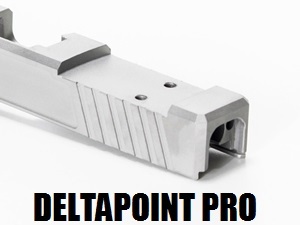 Deltapoint Model is machined to accept the Deltapoint Pro with Leupold Rear Sight unit. DPP Cover plate that accepts the Leupold Rear Sight Module is included. Metric mounting screws for the DPP are also included. Deltapoint Model is machined to accept the Deltapoint Pro with Leupold Rear Sight unit. No cover plate is supplied with the Detlapoint model. These slides come ready to accept OEM internals, barrels, and guide rods. The KE26 slide is compatible with all Glock 26 Gen 3 OEM components. Striker channel liner is included.